For the second week in a row, Made it Monday has nothing to do with clothes, although I did crack out the sewing machine this week. There was still copious vomiting (and worse…) for the remainder of last week, so while I needed some creative time out for my own sanity, it had to be a quick and dirty project. I enjoy making quilts, but they are time and labour intensive, and realistically, they are pretty far down the priority list. It’s a shame, because I have heaps of beautiful quilting cottons in my stash. 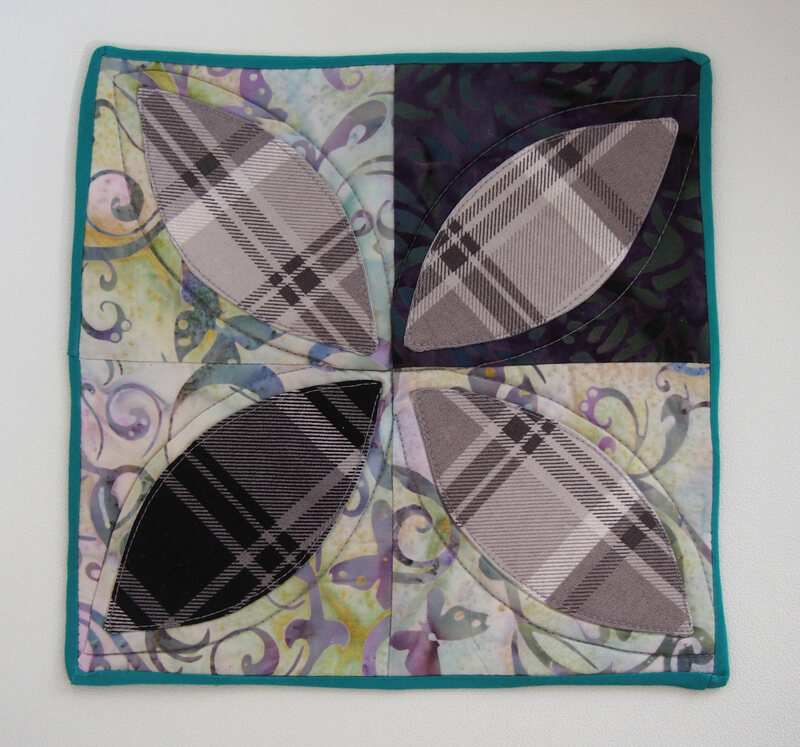 I stumbled across a tutorial the other day though that seemed to be the perfect project, and made myself a mini-quilt. The block is a traditional block called Orange Peel, and while I normally don’t get too excited about traditional blocks, I like the shape of the pieces, and thought the way the applique was attached was really clever. Applique, which is when one piece of fabric is sewn on top of another piece, doesn’t really float my boat as it tends to be quite fussy and old fashioned, have raw edges, or if you want to hide the edges, be time consuming . Instead, this tutorial uses light interfacing to both attach and hide the outside edge, so I was finally convinced to give applique a go. I used two grey plaids from a layer cake I bought from Spotty ages ago, and the background of the blocks are some batik scraps from the wall quilt I made for my Mum’s 60th birthday (which, coincidentally, was the last time I tried to applique! Weird). I bound it with some bought bias binding, and actually hand stitched it on the back – how time-indulgent! 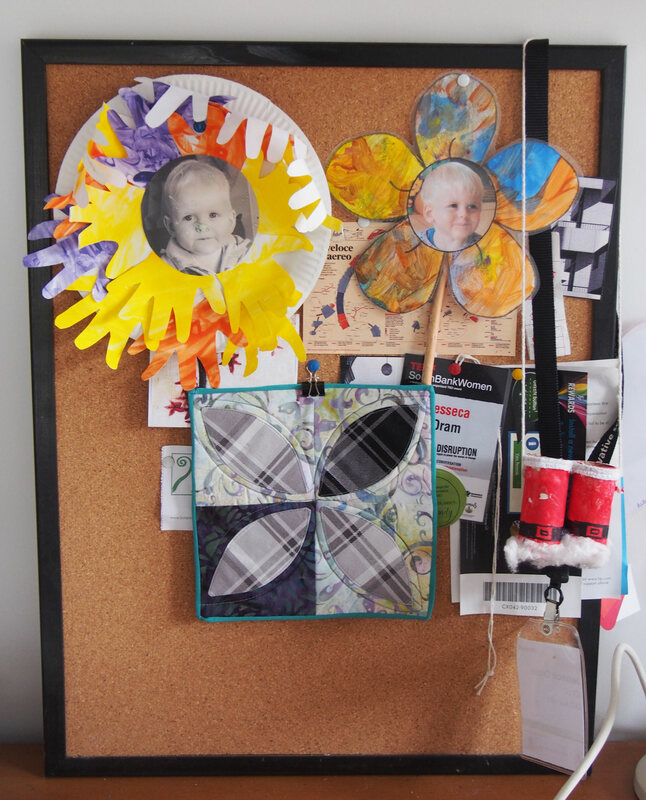 I should probably come up with a pretty hanging solution, because I have a suspicion this will be the first of many minis, but for the time being, it’s hung with a bulldog clip on my cork board of treasures. Awww, look at my little boy.